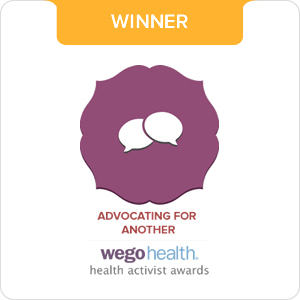 Over the weekend, I got an email from Parent's Magazine saying that I had been nominated for a Best Mom Blog Award in the category of Kids Health! 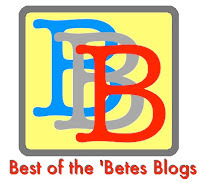 There are lots of wonderful blogs nominated. I am definitely in good company! And I found some really cool blogs in the different categories. One made me almost spit coke out my nose! I would be totally honored if you went on over and voted for me! All you have to do is click HERE. If you don't already have an account, you'll be asked to create one. I know that can be a pain so THANKS for doing it for me! But it's not just for ME. It's really for all of us. We stand united in this community. We work together to raise awareness. To educate. To advocate. 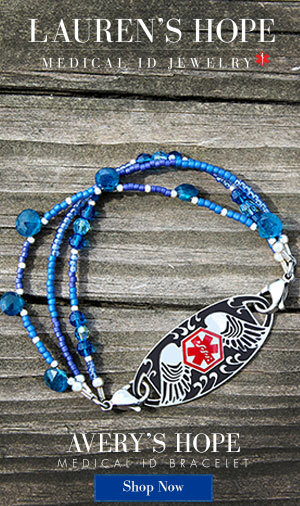 This is a wonderful way to get the word out about what it's like to live with type 1 diabetes. It is a fantastic opportunity. And I am so completely honored to be representing "us"! We are a family here in the DOC. We stand by each other. We work together. We care. We encourage. We support. With every post. With every email. With every comment. And I am so thankful to be a part of this community! I really do consider you all to be family! And I (heart) my family! THANK YOU. Your love and support for me and my blog is amazing. It truly means the world to me. Because, you see, this is not the post I had planned for today. Because as you are reading this, I will be sitting in a hospital waiting room while my Dad has open heart surgery. If you are the praying type of person - prayers are much appreciated!! 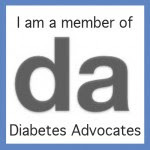 I normally don't write about things that are not - in some way - related to diabetes. This IS a diabetes blog, after all. However, diabetes does seem to soak itself into many aspects of our lives. And this is no exception. As you may know, Sweetpea LOVES her Mimi and Gaga. They have taken care of her every day after school for the past two years. She rarely goes more than a day without seeing them or talking to them on the phone. They, of course, think the sun rises and sets in her. And the feeling is mutual. We love him very much! 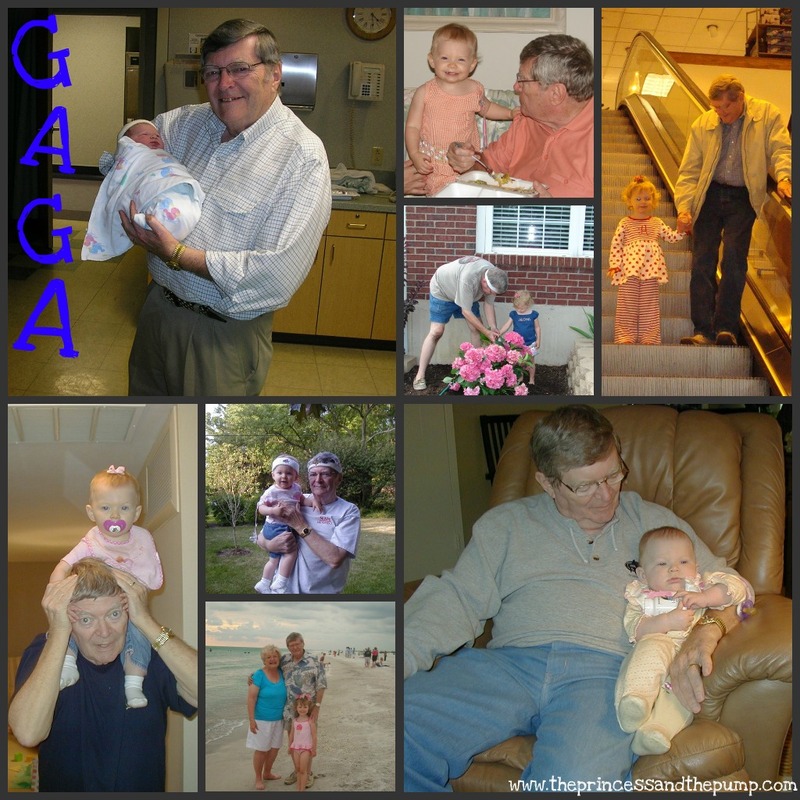 He's not only a wonderful Gaga, but he's also a wonderful father. And I do (heart) my Dad! 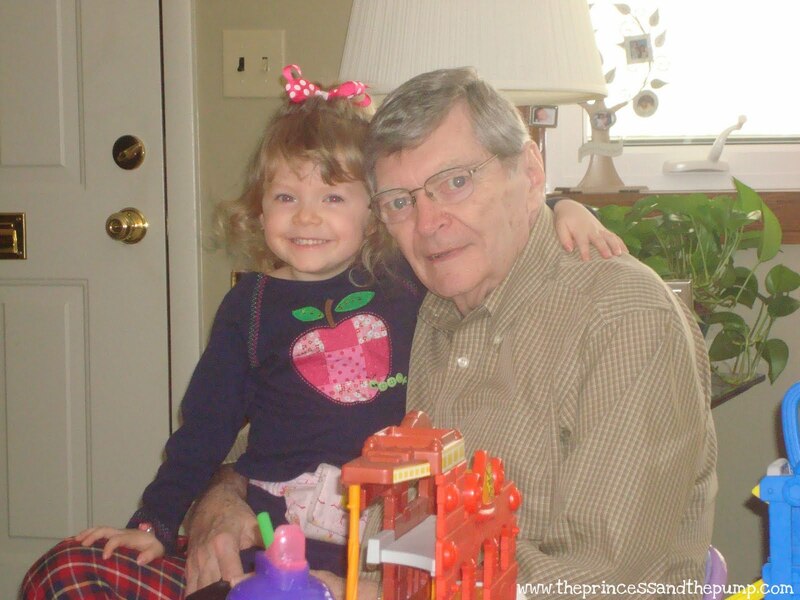 He was at the hospital every day when she diagnosed. He learned how to count carbs and test blood sugar and give shots. He comforted Sweets AND me. 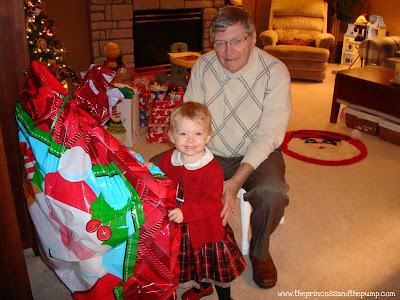 He will drop everything to bring her blankie over when she's left it at their house. He will play cars for hours. He drove J to the hospital not long ago when Sweets had the seizures and she and I were taken by ambulance. He scratches her back. And reads her stories. And he always gets more kisses than Mimi! So, naturally, she would be worried about him being in the hospital. Any child would. But most 5 year old just don't quite "get" what goes on there. 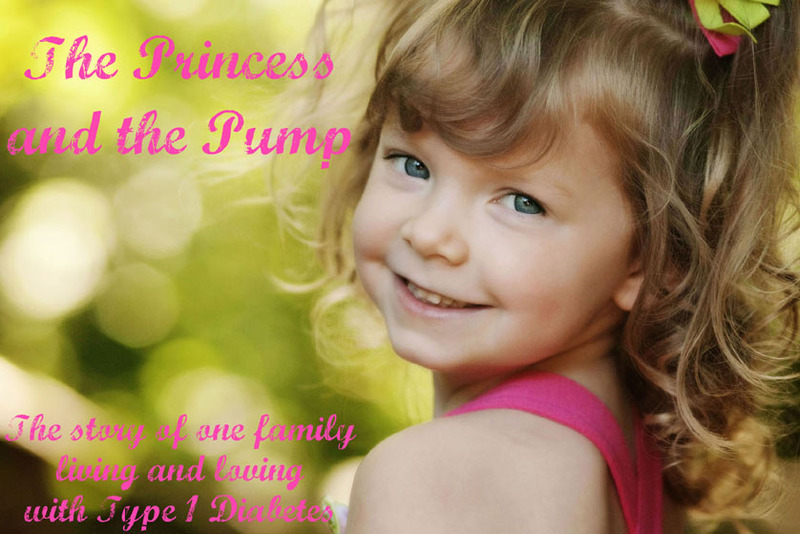 Unless the 5 year old has type 1 diabetes and has spent quite a bit of time in hospitals herself. More than your average bear, anyway. She's worried. She asks questions. "Will he be in a wheelchair?" "Will he have tubes hooked up to him?" "Will he have to get shots?" "Will they take his blood?" "WHY does he need a new heart?" She thinks about it. And has been asking questions for a few weeks. She's even started to cry a few times. Which is not good. That makes ME start to cry. But if I cry, SHE will totally lose it. So I have to keep it in check. It's just another example of how diabetes affects all aspects of life. Not necessarily in a bad way - because I think it has definitely made her more empathetic to other people. It just makes our lives... different. Thank you for VOTING for me!!! P R A Y I N G in AZ, my friend. Plenty of prayers and positive thoughts for your dad! He sounds like a great man! I hope everything goes smoothly and his recovery is quick! Praying for you, Hallie! And voting for you too!! Thanks for all you do! And I hope your dad's surgery goes great and he has a speedy recovery! Love ya!! Hugs and prayers to your father and your family today and evey day. Good luck to your dad, Hallie. We are the praying sort, and we've got him in ours. Congrats on the honor, and for sharing that - you are so right, that it's about community and you are an incredible part of that. Thanks for what you do, including offering gems like the one where Sweets is thinking about the WHY behind the new heart.. I can just picture that, and it makes my heart both smile because of her curiosity but also hurt because of what it is. Anyhow, good luck and we love you all. 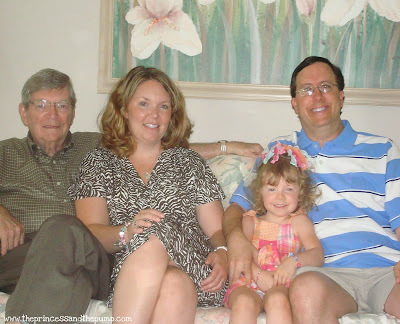 Sending love and prayers to your father as he undergoes surgery. All will be well Hallie. I can not think of a better person to represent this "family" and an thrilled that there is an opportunity to educate more people about T1. Your dad and the whole family are in our prayers today. Love you! Praying for your family Hallie. Gaga sounds wonderful, and Sweets is blessed to have him. HUGS prayers and congratulations sent your way! You are an amazing Momma, blogger, and representative of the voice of the DOC. I will be thinking of you and your family today and praying that all goes with with your Dad. He sounds like a fantastic man and a wonderful Gaga to your princess! You got my vote! I have been reading your blog and loving it since my son was diagnosed last year...and you even took the time to respond to my email too...Thank you! Sending you all my love and prayers today. I'll remember your dad in my prayers. What devotion he has. Men like him amaze me in their total gift to others. I'm so happy you both have him in your lives. And, congrats on the Parents nomination.